Brad Rubin and Chris Jones carved their names in bass fishing history by sacking an impressive 17.58-pound, 5-fish limit to win the North American Bass Circuit's first-ever tournament, held on Wisconsin's mighty Lake Winnebago chain. Their mixed bag of beefy largemouths and bronzebacks-anchored by a 4.52-pound smallie that was big bass of the tournament-earned them a $10,000 first-place check, along with bonuses including $1,000 Ranger Cup, $500 Cabela's Angler Cash, $100 Oxygenator and $750 in Big-Fish Pot winnings. "We're pretty happy," beamed Jones, of Neenah, Wisconsin. "We expected it would take over 17 pounds to win. After practice we felt good that we'd be in the running, and it turned out perfect." "It's always great to fish with Chris," added Rubin, of Antioch, Illinois. "He definitely had the home cooking on this body of water-he lives a mile from the ramp. A week of prefishing didn't hurt. We fought through hot weather and high winds early in the week, then really cold weather and decent winds the rest of the week, but we made it happen." 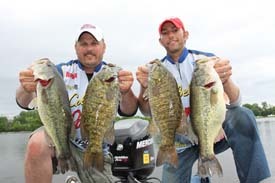 Tournament partners for five years, Rubin and Jones expected bedding smallmouths, but prefishing quickly proved it would be a post-spawn bite. Their winning program included targeting main-lake points and "high spots" with rocks and weeds in 2 to 8 feet of water, throwing ¾-ounce football jigs tipped with soft-plastic trailers, fished in a variety of manners. "We had to use different techniques," said Rubin. "Sometimes they hit the jig popping off the rocks, sometimes dragging, sometimes just reeling it in slow." In all, the top 5 teams shared a $16,000 payout plus Big Fish Pot and sponsor contingencies. Third-place finishers Gary Adkins, of Green Bay, Wisconsin, and Carl Scharenbroch, of Saukville, Wisconsin, won the U2 bonus for being the highest-placing team with U2 Pro Formula Livewell Treatment in the boat. In 12th place, fellow Wisconsinites Mark Duerr, of Milwaukee, and Tim Sadowske, of Waukesha, earned the $250 Optima True Blue Rewards bonus. As a bonus courtesy of Rapala, Trigger X and Sufix line, the top four teams also received a great line and bait package comprised of these fine products. The Winnebago Chain yielded 141 bass weighing a total of 372.79 pounds. All but one were released alive in the NABC's catch-and-release format. The Circuit's Bass Conservation Fund donated $15 per boat, for a total of $480, to the Wisconsin Department of Natural Resources for fisheries projects on the Winnebago system. To date, the NABC's sister trail-the Cabela's Masters Walleye Circuit-has donated more than $275,000 to fisheries projects where our tournaments are held, and the NABC is proud to build on that great tradition of fisheries conservation. Throughout the weigh-in, the NABC and National Professional Anglers Association presented kids age 12 and under with great gifts, including free rod-and-reel combos, along with free tackle packages from Northland Fishing Tackle. To the delight of the large crowd gathered at scenic Menominee Park in downtown Oshkosh, a parade of youngsters took the stage to accept their tackle, offer their thoughts on bass fishing, and share their dreams of one day joining the ranks of the NABC's tournament anglers. This was the first stop of the NABC's inaugural season. Next up is the world-class smallmouth fishery of Lake Michigan's Bays de Noc at Escanaba on July 30-31 (one-day event includes a built-in bad-weather day). The third and final qualifier is August 19 on Minnesota's legendary Lake Minnetonka. NABC teams are vying for a coveted invite to the World Bass Championship, set for Sept. 24-25 on Leech Lake, Minnesota. The 50-boat qualifiers reward teams paying the $400 entry fee with great odds at a $10,000 first-place cash prize, while the Championship pays $20,000 for first place. The NABC is open to all anglers. And its popular team format-which lets you choose your partner and cut your costs-has stood the test of time for 26 tournament seasons on the Cabela's MWC. Openings remain for Escanaba and Minnetonka. Teams may register by mail, fax, or online. For details visit northamericanbasscircuit.com, call toll-free (877) 893-7947, or email events@namginc.com.